Benoit Hamon may be the French Socialist Party's last chance to reverse its fatal rightward drift. In choosing Benoit Hamon over former prime minister Manuel Valls, French left-wing presidential primary voters resoundingly rejected the Socialist Party’s rightward drift in favor of its social-democratic roots. Unfortunately, it’s not yet clear if the rest of the country cares. Hamon and Valls were polar opposites among the primary’s original seven candidates. The former prime minister incarnates the Socialist Party’s national-security-inflected spin on the Third Way: loyalty to business over labor; a fixation on defense; and a prolonged state of emergency, much of it peppered with dog-whistling to racists and Islamophobes. 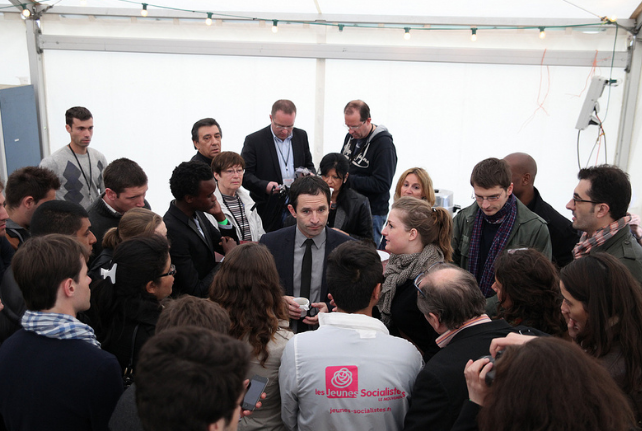 Hamon, on the other hand, resigned his ministerial post in 2014 over disagreements with the party’s turn toward neoliberal economic policies, preferring to spend the last few years as an outside critic and to frame his long-shot primary bid with an ambitious universal basic income proposal. Under normal circumstances, Hamon’s nomination would be momentous. Also in favor of reducing the work week to thirty-two hours (rather than lengthening it, as some have proposed), taxing companies that eliminate jobs through automation, and hiking investment in clean energy, the National Assembly deputy is arguably the most left-wing Socialist presidential candidate since François Mitterand in 1981. But this is not a normal election. Current polls show the Socialists running fourth or fifth in April’s first-round presidential vote — not only behind the two frontrunners Marine Le Pen of the National Front and François Fillon of the conservative Republicans, but also Emmanuel Macron, an independent centrist, and sometimes Jean-Luc Mélenchon, a populist firebrand to the left of the PS. Five disastrous years of President François Hollande, who vowed to take on the power of finance and reduce unemployment but did neither, have understandably tested voters’ patience with the Socialist label. And it showed with the primary’s abysmal participation: just over two million people turned out on Sunday’s first round of voting. That’s far less than the 4.4 million people who voted in the right-wing primary runoff last November. But it’s also well below the 2.9 million who cast ballots in the second round of the 2011 Socialist primary. More specific second-round figures are not yet available. But in the first round, at least, the lack of interest was especially pronounced in traditional working-class bastions of left parties: the suburbs of Paris as well as certain towns and cities spread across the industrial north and east of the country. These are many of the same communities that are backing the National Front or disengaging from politics altogether. The two often go hand in hand. Nevertheless, Hamon’s victory is an encouraging sign for those who believe in the prospects of a renewed, progressive, post-Hollande PS. The Socialist base, or what remains of it, has set forth its vision for the party’s future, and it amounts to an utter repudiation of the current government. The campaign amounted to a referendum on the party’s rightward drift, and left-wing forces have triumphed. Cleavages between Hamon and Valls run the gamut. The former has vowed to repeal a deeply unpopular rollback in collective bargaining rights championed by the latter. Hamon’s vision of a society that works less and receives more government aid stands in sharp contrast to the former prime minister’s neoliberal worldview. So too does his more tolerant conception of laïcité, the French tradition of secularism that has been used by politicians like Valls in recent years to score cheap points against Muslims and capitalize on mounting xenophobia. Last week, one of Valls’s loyal supporters in the National Assembly even slammed the eventual primary victor for catering to an “islamo-leftist fringe.” In today’s toxic political environment, the distinction is a badge of honor. At the same time, Hamon’s win complicates the already remote chances the Left has of squeaking a presidential candidate into the second round and winning the Élysée Palace this year. Current polls show the charismatic and idiosyncratic Jean-Luc Mélenchon, co-founder of the Left Party, winning between 10 to 15 percent of the vote. In the last presidential election, the left-wing populist won 11 percent as the candidate of the broad Left Front coalition, grabbing attention for his relentless attacks on Marine Le Pen and aggressive proposals like a 100 percent income tax on annual earnings above 360,000 euros. This time around, he heads the self-created La France Insoumise, or “Rebellious France,” ticket and continues to target the working-class voters increasingly flocking to the National Front. With Hamon in the general election, Mélenchon will have difficulty garnering much more support than he already has. A Valls victory would have given La France Isoumise a serious shot of rallying a left-wing bloc disgusted at the options available. Instead, these voters are likely to split between Mélenchon and Hamon. For instance, a poll released just before the second round of the Socialist primary found the following: Le Pen leading with 27 percent of the vote, Fillon with 22, Macron with 21, Hamon with 15 and Mélenchon with 10. In his victory speech Sunday night, the Socialist primary winner said he would reach out to Jean-Luc Mélenchon — as well as the much weaker Green Party nominee Yannick Jadot — in the hopes of building a “coherent governmental majority.” A broad electoral alliance of this kind is a logical and worthwhile idea, but it’s difficult to imagine Mélenchon dropping out at this stage. It’s also inconceivable that the Socialists would fail to run a presidential candidate. The campaign has been wildly unpredictable so far. Fillon was not supposed to win the right-wing primary, Hamon was not supposed to win the left-wing primary, and neither Macron nor Mélenchon were supposed to be doing so well in the first place. One should thus be skeptical of all predictions. That said, the Left’s presidential hopes seem limited in the absence of an accord between Hamon and Mélenchon. What’s more, a deal of this kind may be just what’s needed in order to avert the worst outcome in May’s presidential runoff. François Fillon is in many ways an ideal opponent for Marine Le Pen. Having a robust social democrat in his place — one who proposes the expansion of state services instead of cuts — would undercut the National Front’s opportunistic defense of the welfare state from the right. A lot can happen between now and May. But the future of the Socialists and the French left is looking a little bit brighter. Cole Stangler is a Paris-based journalist writing about labor and politics. A former staff writer at International Business Times and In These Times , he has also published work in VICE , the Nation , and the Village Voice . Benoit Hamon may be the French Socialist Party’s last chance to reverse its fatal rightward drift.